Check yourself before you wreck yourself; here's some practical advice for preparing for your trip to Paris. A lot of these things are exactly what I do before traveling abroad myself. See also my survival guide for the long overnight flight to Paris. Before you pack, read up on what to wear (and what NOT to wear) in Paris. This is a great excuse to go shopping! Get yourself some comfortable shoes that are not sneakers! Have the address of your destination (hotel, AirBnB, etc) printed out. Be ready to show this to your taxi driver. Couldn't hurt to print out a Google map of the neighborhood as well. Have your hotel reservation printed out and ready to show at the hotel, just in case. You probably won't need this; your name and ID will do, but it couldn't hurt. 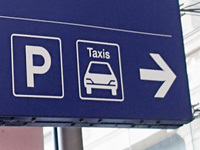 Bring 100-200 euros in cash with you for your taxi (and maybe for a drink/snack at the airport). 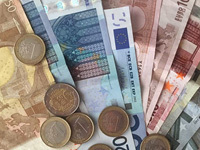 You can arrange to get euros at your bank before your trip. More about money here. Notify your bank and credit card companies a few days before your trip so they know you'll be in France; this way they won't think your cards have been stolen and deactivate them! I just found out my bank finally added a feature on their website where you can record your travel plans online, rather than call. I hate interacting with human beings so this is great; you might want to check your bank, too. Try searching Google for "[bank name] notify international travel" (without quotes). Set up temporary international phone service with your carrier or maybe consider getting a cheap pre-paid phone in Paris if you're spending a longer time in Europe. Noise-cancelling headphones! These are my number one survival tool for long flights. See my survival guide for the long overnight flight to Paris. Don't forget your passport! Duh! Make a couple photocopies of it; keep one copy in your luggage in your hotel, and carry another with you in your pocket or handbag. This way, should your passport and wallet get stolen (and they probably won't, so don't sweat this too much! ), it'll be really easy to establish your identity at the embassy. 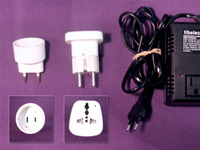 Read up on using your American electronic devices in France. Maybe buy an adaptor or two ahead of time. Although you can certainly buy them in Paris. Buy all your travel size products (shampoo, toothpaste, etc) before you leave. You will not find travel size products in France. I've often been lazy about this on domestic flights within the US; "I'll just buy whatever I need when I get there." Doesn't work in France; you'll end up buying big bottles of stuff and spending way too much. Do some research on the Louvre ahead of time and figure out what part(s) you want to see. This might sound like overkill pre-voyage, but trust me, you don't want to just show up at this gargantuan museum and start poking around; you'll waste a ton of time and miss lots of things you would've wanted to see. Also, I'm not one for making an itinerary for any trip, but it's a good idea to have a strategy for visiting the Louvre when the lines are less insanely long and the place is less insanely crowded. Before your trip, pick a weekday morning, confirm what time they open (and confirm that they are open that day) and stick to that. I recommend this strategy for both the Louvre and the Catacombs. For the other stuff, you can just wing it! Don't forget a small umbrella. I always forget this and don't realize until it's raining and I have to run around looking for one and getting my hair all messed up. Good places to buy a cheap umbrella in Paris: souvenir shops, Monoprix, H&M. Read up on the airport taxi strike scam. Read up on taking the RER (regional train) from CDG to Paris. It's good to know even if you plan on taking a taxi; occasionally there really is a strike. 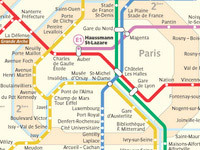 Read up on using the Paris Métro. Good to be familiar with the basics before you dive in on your first day. 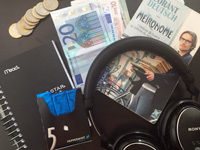 Read up on pickpocketing and other crime in Paris. Be prepared, and then let go and stop worrying about it completely. 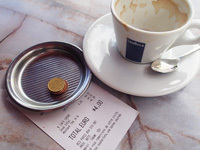 Read up on tipping in France. Read up on basic etiquette for Paris. You know what, just print out my whole website and bring it!